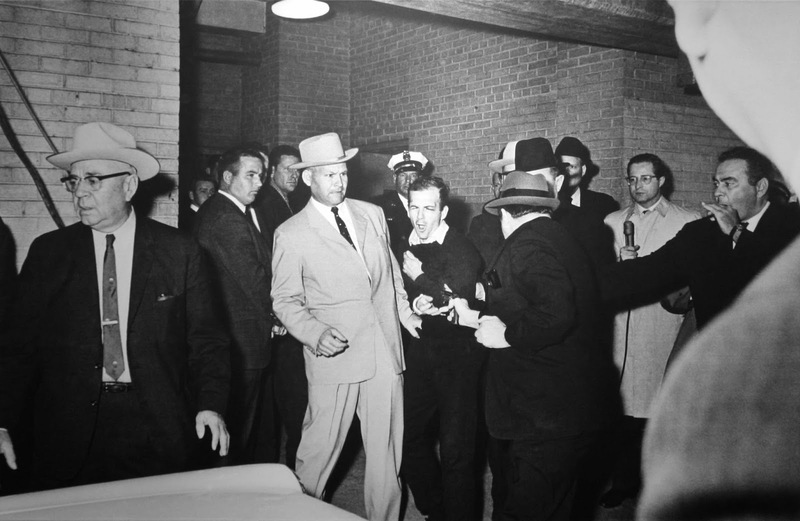 Jack Ruby ready to shoot at Lee Harvey Oswald, as he was escorted to the Dallas city jail via the underground garage of the Dallas police headquarters. 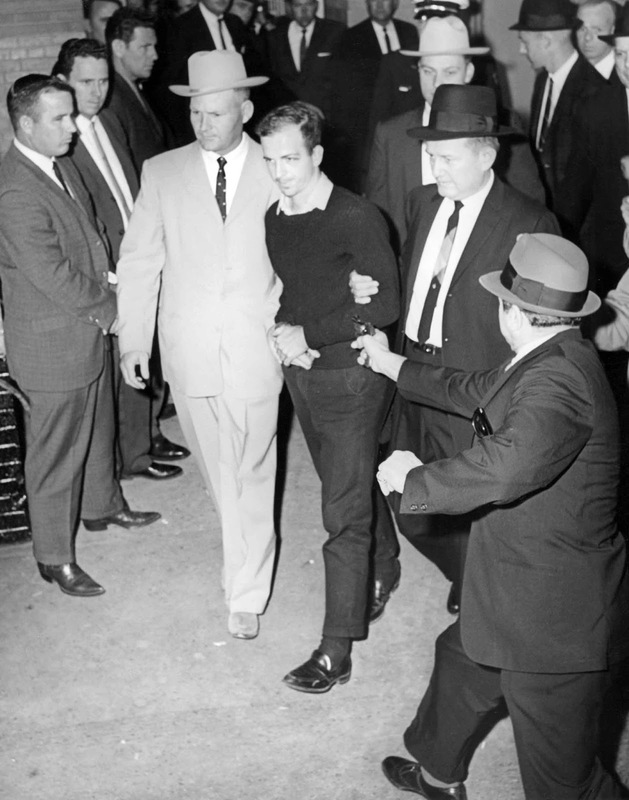 On November 24, 1963, two days after Lee Harvey Oswald was arrested for the assassination of President John F. Kennedy, he was brought to the basement of the Dallas police headquarters on his way to a more secure county jail. A crowd of police and press with live television cameras rolling gathered to witness his departure. 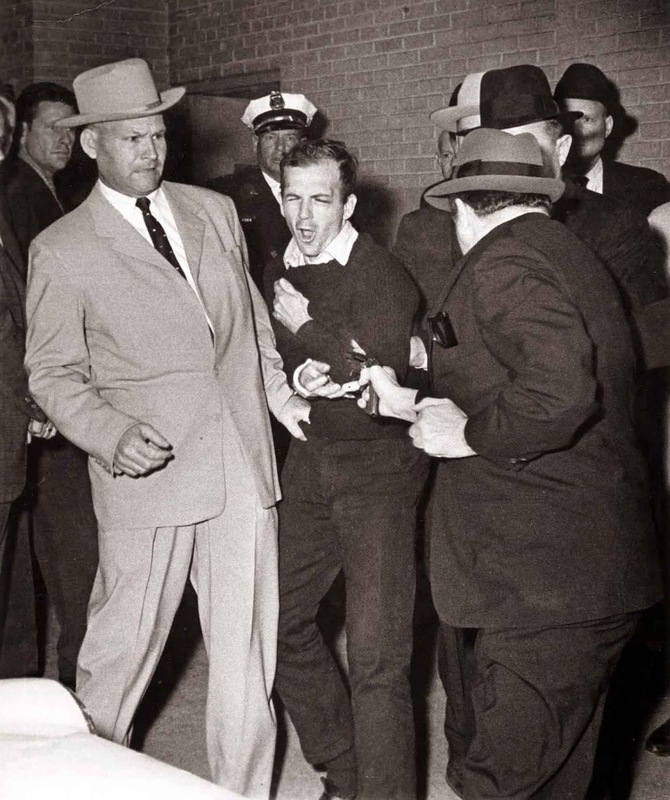 As Oswald came into the room, Jack Ruby emerged from the crowd and fatally wounded him with a single shot from a concealed .38 revolver. Note that Jack Ruby is using his middle finger to pull the trigger on the revolver. It suggests that this was not Ruby’s first rodeo so to speak. Using the middle finger to pull the trigger of a snub nose revolver was a gun slinger type of method. It is used for close-in, very fast shooting where shooter doesn’t bring the revolver up to aim. The trigger finger (index finger) is placed along the side of the revolver and then the shooter points the gun while pulling the trigger with the middle finger. This is not something a novice would do. 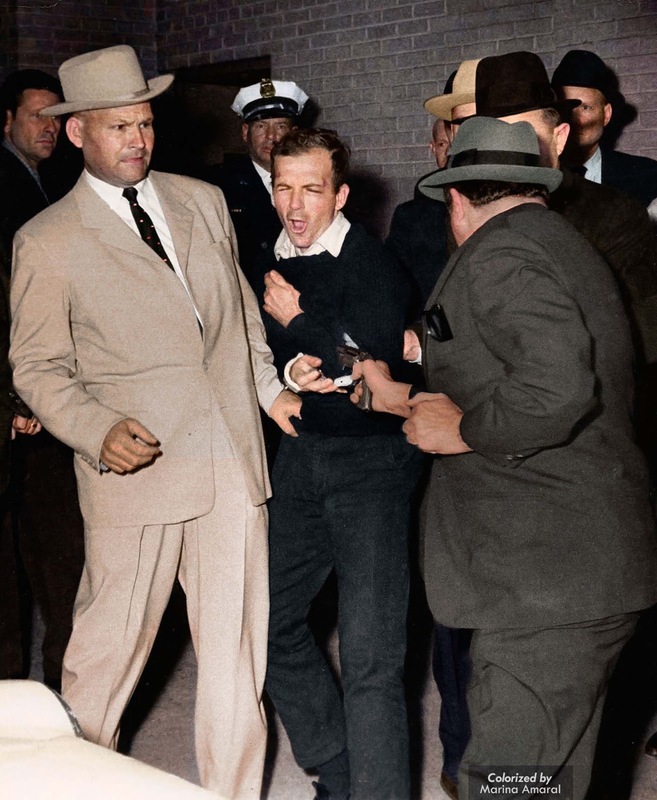 Ruby about to shoot Oswald who is being escorted by Dallas police. Det. Jim Leavelle is wearing the tan suit. Det. L.C. Graves is wearing the dark suit. An autopsy on Oswald was performed in the Office of the County Medical Examiner at 2:45 p.m. the same day. Announcing the results of the gross autopsy, Dallas County medical examiner Earl Rose said: “The two things that we could determine were, first, that he died from a hemorrhage from a gunshot wound, and that otherwise he was a physically healthy male”. Rose’s examination found that Ruby’s bullet entered Oswald’s left side in the front part of the abdomen and caused damage to his spleen, stomach, aorta, vena cava, kidney, liver, diaphragm, and eleventh rib before coming to rest on his right side. Ruby later said he had been distraught over Kennedy’s death and that his motive for killing Oswald was “saving Mrs. Kennedy the discomfiture of coming back to trial”. Others have hypothesized that Ruby was part of a conspiracy. G. Robert Blakey, chief counsel for the House Select Committee on Assassinations from 1977 to 1979, said: “The most plausible explanation for the murder of Oswald by Jack Ruby was that Ruby had stalked him on behalf of organized crime, trying to reach him on at least three occasions in the forty-eight hours before he silenced him forever”. Jack Ruby, originally known as Jacob Rubenstein, operated strip joints and dance halls in Dallas and had minor connections to organized crime. He also had a relationship with a number of Dallas policemen, which amounted to various favors in exchange for leniency in their monitoring of his establishments. He features prominently in Kennedy-assassination theories, and many believe he killed Oswald to keep him from revealing a larger conspiracy. In his trial, Ruby denied the allegation and pleaded innocent on the grounds that his great grief over Kennedy’s murder had caused him to suffer “psychomotor epilepsy” and shoot Oswald unconsciously. The jury found him guilty of the “murder with malice” of Oswald and sentenced him to die. In January 1967, while awaiting a new trial, Ruby died of lung cancer in a Dallas hospital. The official Warren Commission report of 1964 concluded that neither Oswald nor Ruby were part of a larger conspiracy, either domestic or international, to assassinate President Kennedy. Despite its seemingly firm conclusions, the report failed to silence conspiracy theories surrounding the event, and in 1978 the House Select Committee on Assassinations concluded in a preliminary report that Kennedy was “probably assassinated as a result of a conspiracy” that may have involved multiple shooters and organized crime. (Photo credit: Robert H. Jackson. Full image / Colorized version by Marina Amaral). This piece of world history is etched in stone in my memory. I was a 14 year old schoolkid in Bombay ---now Mumbai---and Kennedy had been my hero. Imagine my shock when he was shot dead by Lee Oswald! For a naive kid like me and to millions and millions of people the world over,, Jack Ruby had been a knight in shining armour who had come riding on a steed and taken revenge by shooting the assassin dead! I was almost 14 when JFK was murdered, I remember it like yesterday. Kennedy wanted an end to the Vietnam war buildup. He also was printing United States Notes outside the Federal Reserve. His death was the death of hope and of this nation.